Maybe the baby has been crying uncontrollably. Perhaps the children have brought home the dreaded gastro and landed you a couple of sleepless nights. Or maybe the litany of complaints from your visiting mother-in-law has worn you out. Perhaps the shortening days herald the winter blues. It could be the perfect time for some autumn rescue before we head into the fraught season of Christmas folly. There is a magical place in the heart of the 14th in Paris called Quintessences where I welcome you with a warm smile. Come to relax deeply and rejuvenate your spirits, with craniosacral therapy, a touch so gentle as to be equally effective for the colicky baby and the stressed mother. As soon as our body has a chance to self-heal it does. 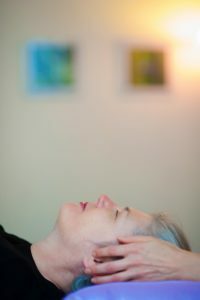 My expert hands melt away those knotted tensions while you let yourself experience the pure essence of your own body’s natural healing power.